In June 2016 we’ve bought the Fallout 4 game, after a long time dreaming of playing it. You’ve probably downloaded the mobile version of the Fallout 4 before the release, right? Fallout Shelter was great – and it taught us a lot about how to survive in Fallout 4. But what called my attention was the idea of having companions during our missions. First, you start with nothing and then you find a dog – Dogmeat. The dog is cute and makes you feel less lonely during the quests in the wasteland. As we know, if you’re hiding, forget about it – the dog will be around biting things. This changes when you start having a human companion – MacCready. MacCready is not a typical friend and it takes a while for that to happen. He is a companion and he wants to be paid to do the work. He likes when you steal things and with time he can become your friend, just making jokes during the game. I must admit, Bethesda has done a pretty good job there while developing NPCs. 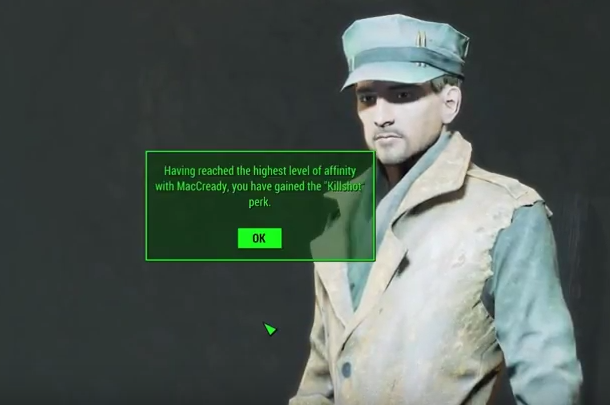 I can’t even say that MacCready is a non-playing character – he makes jokes, he is funny and he is unique. And what is interesting about that is that your decisions in the game can increase or decrease your affinity with companions. Read this post in Reddit and then you will know a bit more what I’m talking about. Look at this chart. Things that you do in the game not only impact your overall progress but they also impact the way your companion perceives you. What is fascinating is the different aspects and personalities that emerge from those decisions. What makes such character so believable? Maybe the jokes, maybe the non-expected reactions. This is definitely something to think about. In the end, it is a bit of psychology involved. It makes you think about the things that create and maintain good relationships. Not only that, if your character is a woman you can start a romance! You’ve been through so many things together, so many quests, so many bad and good moments. I bet this made people feel more engaged with the game. In my opinion, there is a lot to learn from MacCready in terms of design and artificial intelligence. First, what makes friends good friends – and how to implement this in games. Technology becomes more human – and we develop a kind of affinity towards it. Now image how this could be used to motivate people to do other things. If you’re recovering from a certain illness or if you want to improve some skills. Having a friend becomes more than just a support. It is a way to match your actions, a way to make you reflect about your decisions. This is just the beginning. My first play of Fallout 3 I choose to venture with Dogmeat since he’s adorable and the companion system in FO3 is far more shallow but when I played FO4 I still choose to have our canine friend to be with but, sometime later on the game when I was level 40 something I do realized that I was bored so I tried to have another companion and it turned out to be Maccready since he’s the least that I know yet unrecognized at first. At first he’s plain irate towards the sole survivor but a time goes by and you finished he’s quest you’ll understand what he’s been through in the past 10 years after FO3. He’s more knowledgeable with he’s surrounding but can’t identify the difference between a radroach with a mirelurk hatchling. I’m very comfortable having him and he had a very PERK when you’re a sniper build. Previous Previous post: Are we heading towards the era of Minimalism?